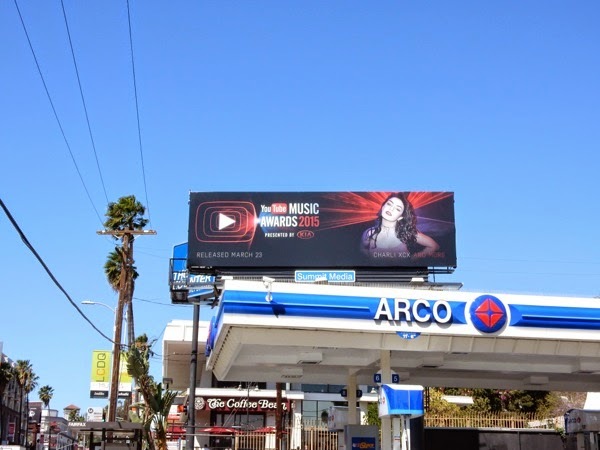 Just when you thought there weren't enough awards, this year you can add yet another set of accolades to the skies of L.A. to follow in the footsteps of the Golden Globes, Oscars, Grammys, Kids' Choice Awards, MTV Awards and many more besides. 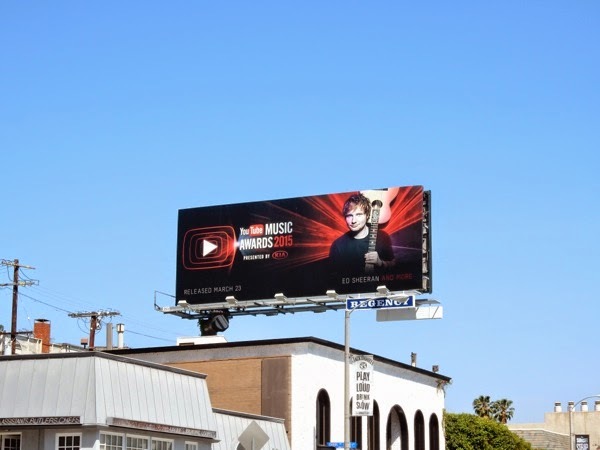 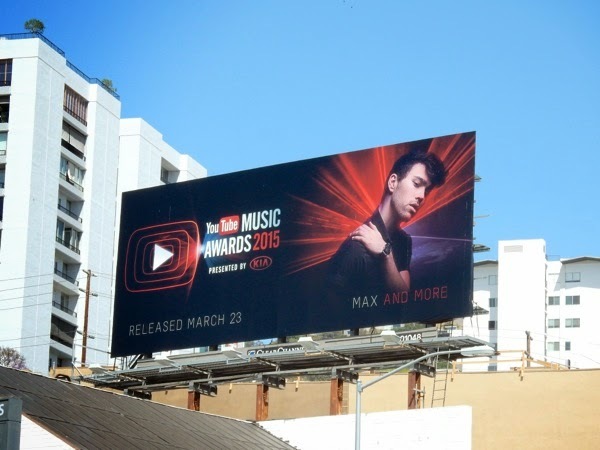 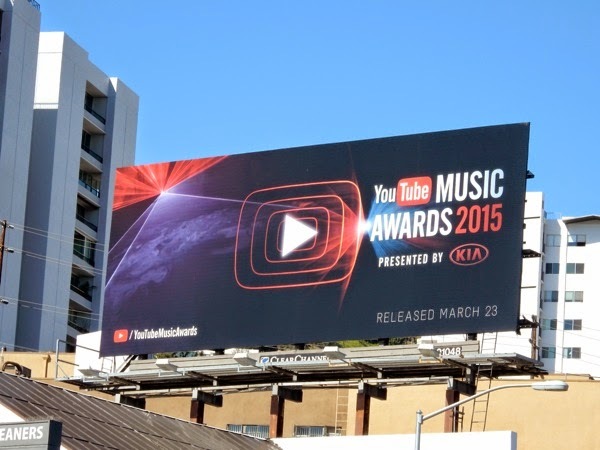 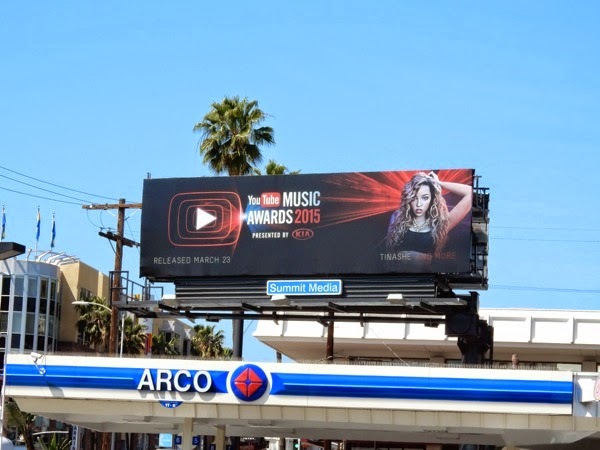 This laser-filled outdoor ad campaign celebrates the 2015 YouTube Music Awards as they announced at the end of March the 50 winning artists who bring music to life on YouTube, which has become a launch pad for new talent and the next generation of singers, songwriters and musicians. 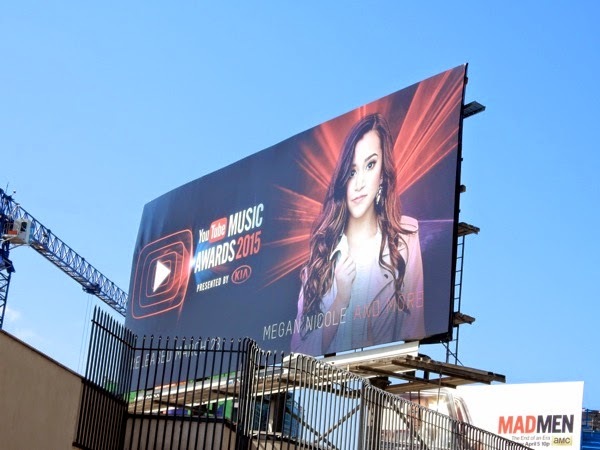 The winners are chosen by fans, measured by their success in views, subscribers and engagement on the video platform over the past six months. 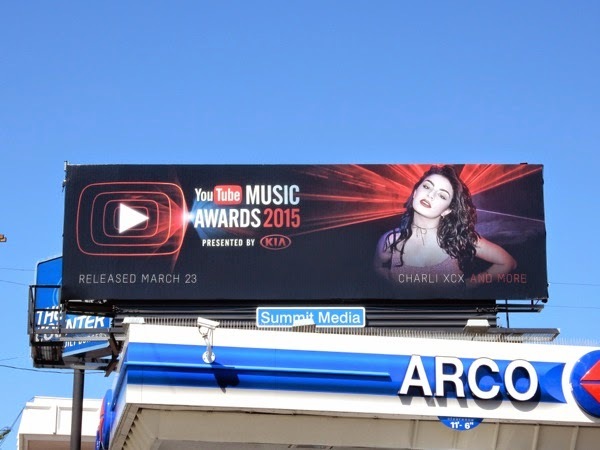 To mark the occasion YouTube has worked on exclusive videos with new tracks and original collaborations with some of the winners, like Charli XCX, Megan Nicole and Ed Sheeran. 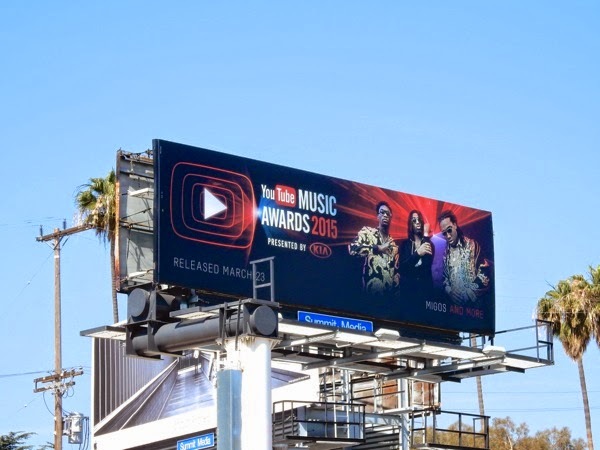 The YTMA ad creative without any artists was snapped on March 6 at the intersection of Santa Monica Boulevard and La Cienga Boulevard in West Hollywood. 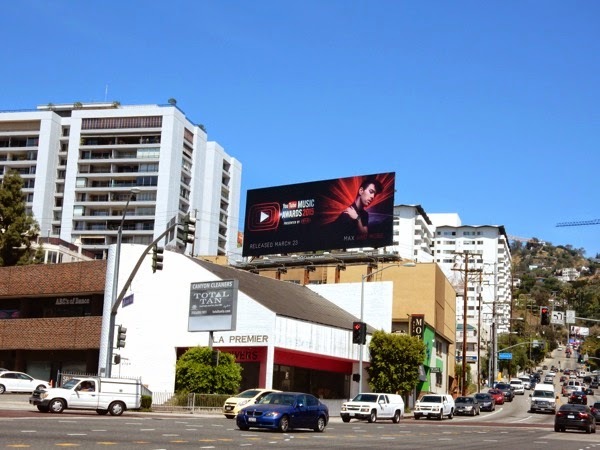 Meanwhile the subsequent billboards featuring the artists were spied from March 31 to April 2, 2015, in the same WEHO ad location and in multiple ad sites along Sunset Boulevard. 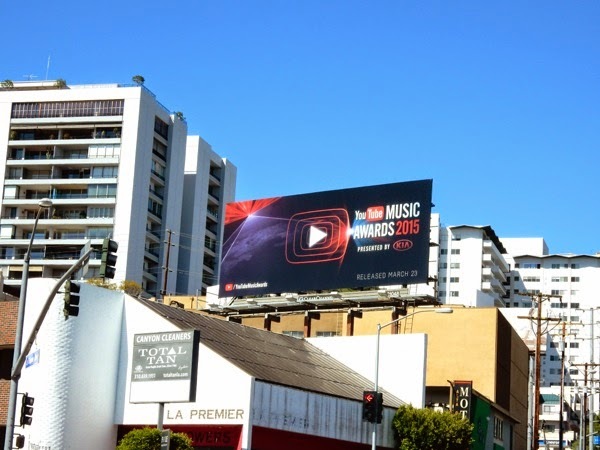 The last time YouTube had such a presence in the city skyline was when it was promoting its series Video Game High School last Fall. 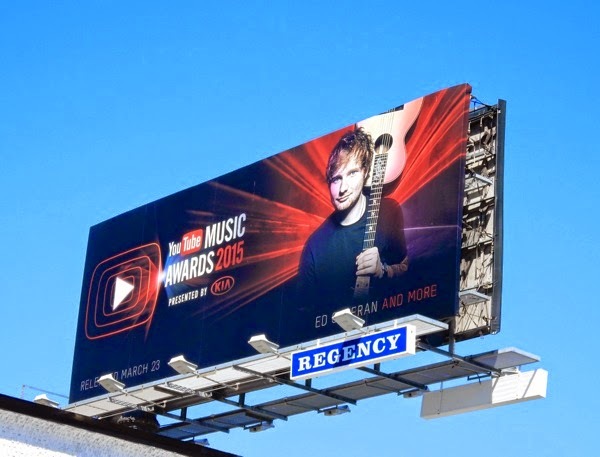 For different approaches to awards ad creatives, be sure to check out these billboards for The Grammys, billboards for the Oscars and these MTV Music and Movie Awards ad campaigns. 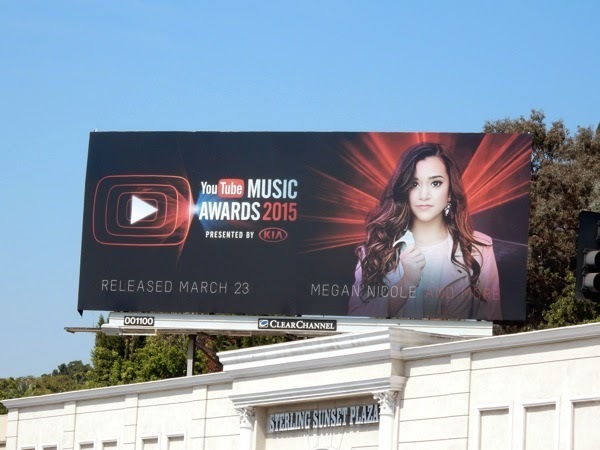 UPDATED: Here's a better version of the Megan Nicole billboard along the Sunset Strip (all the construction is making it insufferably hard to get good shots of the billboards these days), plus a billboard for Atlanta hip hop group, Migos, spied along Wilshire Boulevard in Brentwood on April 11, 2015.